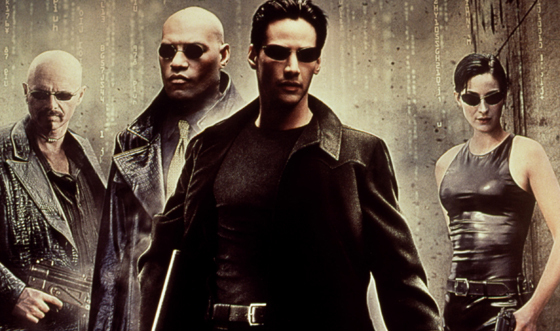 Perhaps the most widely embraced recent pop cultural offering to the effect that “we can see whatever we want wherever we want” is the 1999 film The Matrix. In that movie, the solution is simple — and rather crazy. One’s entire physical world is replaced by a simulated world. In a sense, the conceit behind The Matrix is like putting Neal Stephenson’s Metaverse and Star Trek’s Holodeck on steroids. Where those two fictional ideas suggest a 3D immersive cyberspace merely as a place to visit (the virtual reality world in Caprica has a similar conceit), The Matrix suggests that life itself be lived entirely within cyberspace — generally without even the awareness that one is inhabiting an artificial construct. Of course that change ups the ante considerably. The artificial world must be perfect, because it serves, for all intents and purposes, as reality. Once this level of fidelity can be achieved, then anything is possible. People can have super powers, and objects can change form or even disappear instantaneously, just as they can in any computer graphic scene. 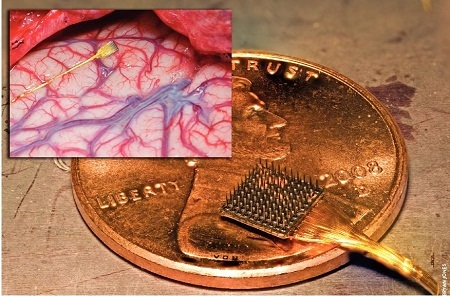 But is such an all-encompassing direct brain interface possible? There isn’t much indication at this point that it is. Or at least, nobody yet seems to have a real clue how to go about it. The problem isn’t the physical connection of electrode arrays to brains. That’s difficult, but not impossible. Science has already advanced considerably beyond the version shown below. And in the next twenty years direct brain/computer interface technology is likely to advance far beyond what we can do today. No, the basic problem is that your perception of reality is already a construct — one maintained by your brain. For example, you don’t literally see things the way a camera does. At any moment in time, your eyes see only a tiny window into reality, from which your brain then constructs a plausible model. It is really this constructed model that you “see”. We don’t know very much about how this construction process works, which means we can’t hack into it with any effectiveness. And even if we could, a direct brain interface like the one in The Matrix would need to replace the considerable amount of image processing done by our optic nerve. We might also need to simulate the saccades and other movements made by our eyeballs as our brain continually refocuses its attention. Most likely the best way to transmit visual information to our brains is the old fashioned way: by sending photons of visible light into our eyes. This entry was posted on Saturday, October 30th, 2010 at 4:28 pm	and is filed under Uncategorized. You can follow any responses to this entry through the RSS 2.0 feed. You can leave a response, or trackback from your own site.